Home » Cancer » Can These 4 Supplements Prevent Cancer? Various forms of cancer are responsible for a great deal of pain and suffering in our communities. Cancer is also one of the leading causes of death in North America. Fortunately, the risks of developing certain types of the more common cancers like those occurring in the breast, cervix, lung and prostate, are well understood. Regular medical check-ups and appropriate screening can be useful in prevention. However, lifestyle issues including nutritional status can, in some cases, influence cancer development. Here are the top four supplements I recommend for cancer prevention. Green tea extract contains a polyphenolic chemical known as epigallocatechin gallate. This chemical is a potent free radical scavenger and prevents cellular damage and pre-cancerous growth caused from chemicals and pollutants. 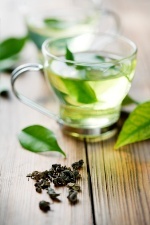 Various studies have previously indicated that green tea or its extract can decrease the risk of oral cancer. Other studies have also shown a decrease in the incidence of oral cancer in smokers who ingest green tea. There are many benefits of garlic. Garlic has been previously shown to reduce or prevent cancerous growth in several different cell lines. In addition, eating garlic has also been attributed to a lower incidence of various types of cancers including lung and stomach. The protective effects of garlic are found in the unique sulfur containing compounds such as diallyl sulphide. Garlic compounds have also been shown to prevent the migration and subsequent spread of cancer cells. Reap the benefits of garlic! I recommend taking the equivalent of two to four grams of raw garlic daily in an aged extract form. This unique compound is an indole compound found in cruciferous vegetables. This chemical is one of my favorites because it has been shown to inhibit cancer growth in various cell lines. Indole-3-carbinol is also quite helpful when used in concert with chemotherapeutic agents to destroy cancer cell growth. This is especially apparent in breast cancer cell studies. The recommended dosage for breast cancer prevention is 300-400 milligrams (mg) per day. Isoflavones are chemicals found in soy beans, which gives them their important medicinal qualities. The increased intake of the two principle isoflavones, genistein and daidzein, have been known to reduce the incidence of breast cancer in Asian countries. These chemicals do prevent cancer cell growth directly but they also can block estrogen receptors in breast tissue reducing the risk of excessive cellular growth propagated by estrogen. I recommend 200-400 mg of soy isoflavones daily taken with food. Radoï, L., et al., “Tea and coffee consumption and risk of oral cavity cancer: results of a large population-based case-control study, the ICARE study,” Cancer Epidemiol. June 2013; 37(3): 284-9. Fu, J.Y., et al., “Tea consumption and the risk of oral cancer incidence: A case-control study from China,” Oral Oncol. May 31, 2013. Yi, L., et al., “Molecular mechanisms for the anti-cancer effects of diallyl disulfide,” Food Chem Toxicol. July 2013; 57: 362-70. Lai, K.C., et al., “Diallyl sulfide, diallyl disulfide, and diallyl trisulfide inhibit migration and invasion in human colon cancer colo 205 cells through the inhibition of matrix metalloproteinase-2, -7, and -9 expressions,” Environ Toxicol. June 21, 2011. De Santi, M., et al.,” The Indole-3-carbinol cyclic tetrameric derivative CTet synergizes with cisplatin and doxorubicin in triple-negative breast cancer cell lines,” Anticancer Res. May 2013; 33(5): 1867-72. Wong, G.Y., et al., “Dose-ranging study of indole-3-carbinol for breast cancer prevention,” J Cell Biochem Suppl 1997; 28-29: 111-6. Xie, Q., et al., “Isoflavone consumption and risk of breast cancer: a dose-response meta-analysis of observational studies,” Asia Pac J Clin Nutr 2013; 22(1): 118-27.